Herbs, spices and other plant materials are rich in phytochemicals, which are valued components for medicinal and nutritional products. 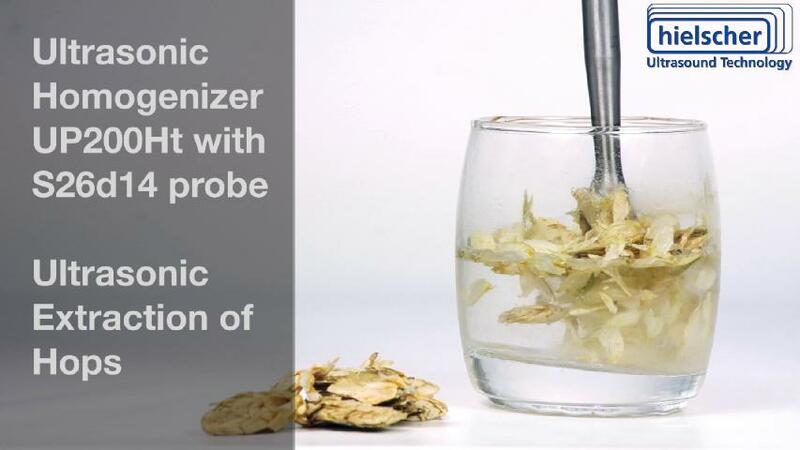 Sonication breaks the cell structure and releases the bioactive compounds – resulting in higher yields and faster extraction rates. As a non-thermal process, sonication is a mild extraction technique preventing the thermal degradation of the extract. Antioxidants are radical-scavenging bioactive compounds, which are found in plants. Antioxidants such as vitamin C, vitamin E, thiols etc. are pharmacologically active substances which are used to improve health and to treat diseases. Due to its high process efficiency, ultrasonic extraction allows to use a very broad range of raw materials to isolate antioxidants. Besides plants such as herbs, fruits and vegetables, high-quality antioxidants can be ultrasonically extracted from low-value or waste materials such as hulls, stems, seeds, rinds, kernels, roots, etc. Adaptogens such as tannins, are polyphenolic, often astringent molecules, which are known for their capability to increase the stress tolerability of mammal cells. Those molecules are entrapped in the plant cell. In order to obtain highly bioavailable adaptogens, the molecules must be released from the plant material. Ultrasonic cell disruption opens the cells by breaking the cell walls and increasing the mass transfer between cell interior and surrounding solvent. 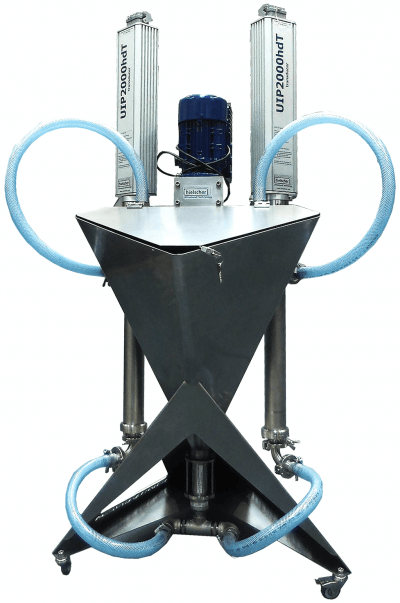 Hielscher Ultrasonics has many years of experience of ultrasonic extraction processes from botanicals for the food, pharma and cosmetic industries. From compact ultrasonic disruptors for lab and small scale production up to full commercial ultrasonic systems for the production of large volumes, Hielscher‘s product range offers the suitable ultrasonicator for your application. All Hielscher ultrasonicators are very robust and built for 24/7 operation under full load. Hielscher Ultrasonics’ industrial ultrasonic processors can deliver very high amplitudes. Amplitudes of up to 200µm can be easily continuously run in 24/7 operation. For even higher amplitudes, customized ultrasonic sonotrodes are available. Intelligent software such as digital control, automatic data protocolling, browser remote control and automatic frequency tuning ensure reliable sonication and continuous output. A broad range of accessories including sonotrodes (ultrasonic probes / horns / tips) of different sizes and shapes, flow cells in various sizes and geometries, boosters, and temperature as well as pressure sensors allow for an optimal sonication setup. Please contact us now with you process requirements! Our team is glad to consult you and to recommend you the most efficient ultrasonic setup. Bashi, D.S. et al. (2016): Evaluation, prediction and optimization the ultrasound-assisted extraction method using response surface methodology: antioxidant and biological properties of Stachys parviflora L. Iran J Basic Med Sci. 19(5), 2016. 529–541. Hashemi, S.M.B. et al. (2016): The Effects of Amplitudes Ultrasound-Assisted Solvent Extraction and Pretreatment Time on the Yield and Quality of Pistacia Khinjuk Hull Oil. J. Oleo Sci. 65, (9), 2016. 733-738. Yu, X. et al. (2016): Ultrasound enhanced aqueous extraction from rapeseed green biomass for polyphenol and protein valorization. Comptes Rendus Chimie Vol. 19, Issue 6, 2016. 766-777. An antioxidant is defined as a molecule that inhibits the oxidation reaction preventing the degradating process of other molecules. Oxidation is a chemical reaction that produces free radicals, leading to chain reactions that may result in cell damage. Antioxidants such as thiols or ascorbic acid (vitamin C) terminate these oxidative chain reactions. Antioxidants are widely used as preservatives in food products to act as phytochemical against its deterioration. For instance, antioxidants are added to food and oils rich in unsaturated fats, since unsaturated fatty acids are prone to oxidative degradation, which causes the oil to turn rancid. Adaptogens or adaptogenic compounds are molecules promote homeostasis, which means they decrease cells‘ sensitivity to stress. Adaptogens are found in herbs and vegetables, e.g. ginseng, schisandra, cordyceps, ashwagandha, rhaponticum, jiaogulan, licorice, rhodiola, holy basil, astragalus, reishi, and maca. Administered as pharmacologically active substance (as drug or supplement), adaptogens are known for their performance enhancing, anti-depressant, calming or wakening effects. The effect is related to the specific adaptogenic substance administered. For performance enhancement, plants such as ashwangadha, moringa, are successfully used, whilst cordyceps mushroom, jiaogulan and rhaponicum are known as anti-aging adaptogens. To reduce stress and anxiety, adaptogens from ginseng, holy basil, reishi, or schisandra are used. Adaptogens for supplementation and medical use are mostly prepared as tonics or capsules.